Accenture has become a global conglomerate not just through organic growth avenues but through strategically acquiring assets to ensure greater depth in their customer relationships and be a one-stop-shop for all professional services requirement for their clients. Accenture wants to be the first one to be called if there a job to be done by their client beyond their core expertise. Accenture has made ~ 70 transactions since 2013. This is by no means a small feat – it requires a well-oiled M&A system to drive so many acquisitions and ensure smooth integration to ultimately deliver value. There is operational nimbleness that is unique to Accenture. In the professional services world, there is no near second though most desire to be an equal. We at Merisis believe that Accenture’s M&A strategy is a leading indicator for the existing trends in the IT industry and the future of the industry. 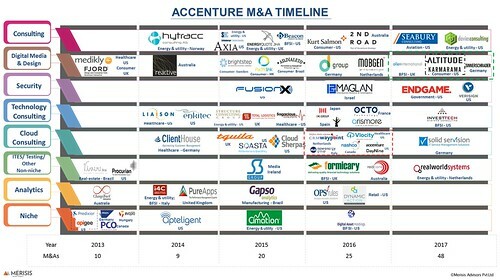 As part of our IT Service Practice, we decided to analyze Accenture’s M&A acquisitions and derive the trends regarding the products, services, industries and geography capabilities acquired. Here’s a quick timeline for your review. You can click on the image to expand in a browser window. Here’s a quick timeline for your review. You can click on the image to expand in a browser window. There are many trends that we have identified. With the limited space that an email provides, let us share the top two. In case you are interested in knowing, please feel free to contact us and we will be happy to share more. 1. One constant we can see in terms of acquisition opportunity has been Digital agencies. There have been about 3-4 acquisitions every year in the area. These acquisitions would be likely to gain entry into a geography or a certain set of clientele unique to those agencies (many acquisitions in a particular area clearly imply that they aren’t done for skill accentuation). These acquisitions opened doors to clients in Germany, Netherlands, Hongkong, Brazil etc. 2. There has been continued interest in SaaS consulting services i.e. 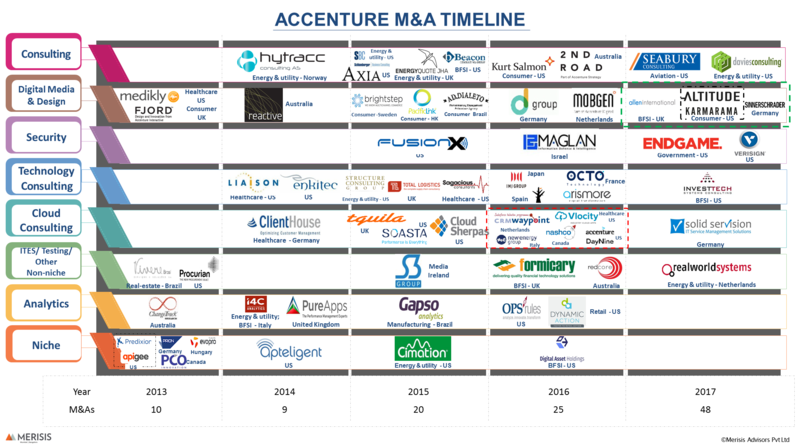 Servicenow consulting (Nashco in Nov 2016 and Solid-Servision.com in Jan 2017), Workday consulting (Daynine Consulting in Sep 2016) and Salesforce Consulting (New Energy Group in Sep 2016) – these acquisitions are interesting given Accenture’s prior acquisition of CloudSherpas which was a major SaaS implementation company. One would assume that this should provide enough of a skill base to expand on – however Accenture seems to be expanding its presence across the sector i.e. skill land-grab. Accenture has the largest base of Saas implementation resources already ~ 33,000 but its appetite for SaaS services acquisitions for people is fairly high – a sign for strong demand (Nashco had only about 25 ServiceNow specialists). 3) There are a few emerging trends which aren’t reflected in Accenture’s M&A list but we can assume that may change soon. On that hopeful note, wishing you guys a great week ahead ! !